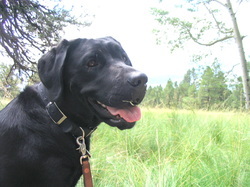 Mina has returned to Flagstaff for a life on the trails. 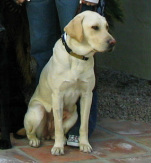 Ritzy was raised by Jane and made a family in Prescott very happy when she career changed in the spring of 2011. 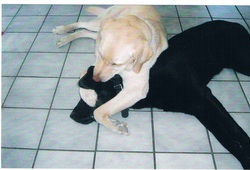 She is pictured here with Jessa, the puppy who took her place when she went back to school. Crispin was raised by Ali and now resides with her, setting a fine example for new pups in training. 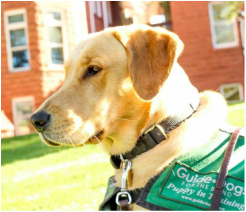 Karleen was raised by Jennifer and now has a permanent home with her and their career change dog, Bev. Prelude was the 13th and final puppy raised by Jeanne. Her current housemate is Kent, no Fresno, no Hero, no "K"
Justine was raised by Monica and now rules the roost at the home of two of her co-workers. She is "the dog" of the house. 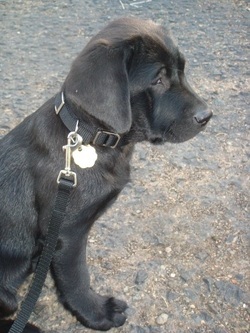 Adira was a puppy in training at the same time as Justine. She now resides with her raiser, Jeanne. Here she is grooming Prelude. goes to find something and then comes back to greet you "properly"!